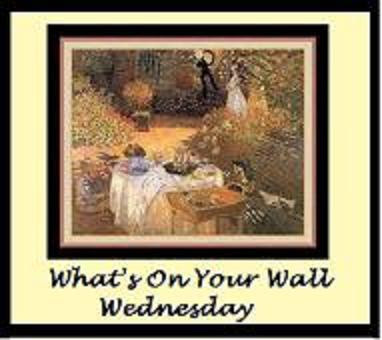 What's On Your Wall and Outdoor Wednesday. Here's why...we are heading out my back door through the patio and to the backyard. Right out the back door is this rack that hangs on the wall. I tried to make it look cute for y'all. Originally my plan was to put lots of live plants on it but the shelves really aren't tall enough. My hubby and boys gave this to me for my birthday one year. I love this wall rack. Tina at Cherry Hill Cottage has the same one only hers is dripping in her adorable dishes! Well, you can just imagine how adorable it is. You know there's a cloche party coming up. Have you marked your calendar? Everybody needs a shut the door sign! Not to be unwelcoming but to keep the flies out! Now on out to the backyard. Here's a little peek at my potting bench. Can you tell how windy it is today? The caladiums are pooped from blowing around. Are you wondering what that rock is? When our son was little he sat and rubbed a stick on that soft red rock until the cross was formed there. I like having those little signs of childhood around - he's 17 now. The fish are coming up to say hello! Really they just hope to be fed. Like puppies. I think you saw this geranium a few weeks ago right after planting time. It's already huge! Thanks for coming to hang out today. 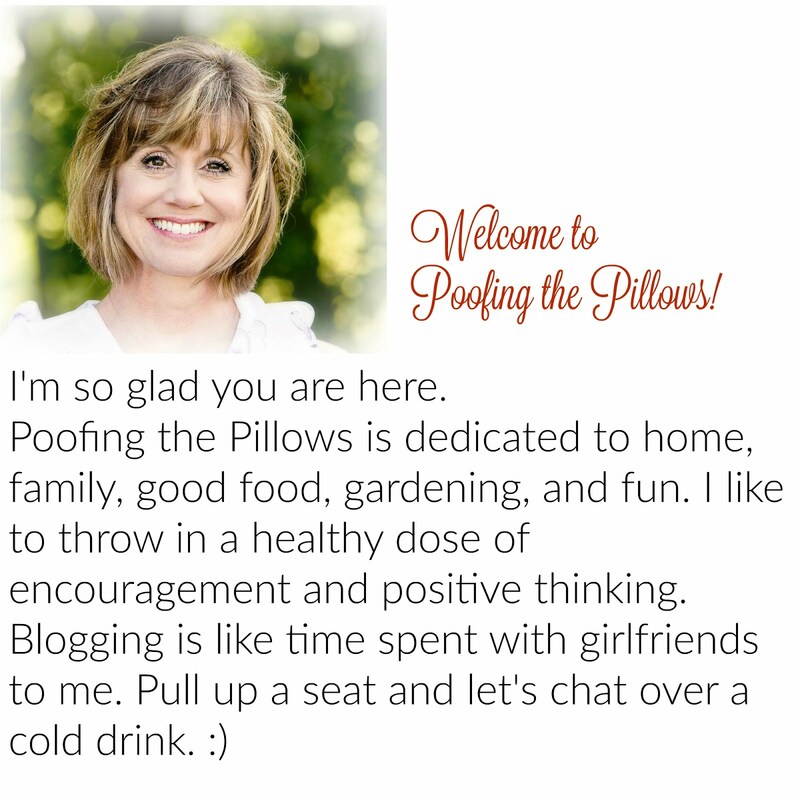 Go over to Barb's blog for What's On Your Wall? and go to Susan's for Outdoor Wednesday. Makes me a little sad to see your huge geranium. Mine was huge a few weeks ago and I divided it. I miss that huge thing! The fish rush to the top of the tank every time I walk past the saltwater aquarium (hey, we have a new fish!) I love that sweet stone. You should give it to his bride some day if you can bear to part with it. And I love what's on your wall, Ms. Stacey! What a nice post. I love the bubbled glass cloche! The fish are adorable, and I love the red rock story! I love your metal shelf piece...how versatile...you can display any number of things on that. Very special rock, too...it is nice to have those little reminders around! Every time I read my blog list I get new ideas. Isn't it wonderful. I love your rock with the cross. I need that sign for my house ! Are those fish yours ! That's alot of puppies, LOL ! I love that Shut the door sign.. but that rock with the cross... Oh My Gosh PRICELESS!! I never get bored with your blog. Two categories and both of them are nicely presented. I like the shut the door sign, the cross engraved, and the vibrant red geraniums. Hope your week is going well. Your garden is just lovely! I love your shelf and the shut the door sign.Thanks for sharing and Happy Outdoor Wednesday! Very cute. I am always telling my husband to shut the door (to keep the flies out)! Thanks for sharing. I need a sign like that for my kids...but only half of them can read! :) Ha! Nice outdoor shelf...Very pretty. Love your fish-- especially their color. What a cute rack, I just love that. I love cloche's also so I will have to watch for the party. The fish are adorable, thanks for sharing with us. I love that rack on your wall and that bubbled cloche is FABULOUS!!! When and where is the cloche party? Those fish are too funny wanting to be fed all the time. They are like the ones by the marina at the lake.....constantly wanting to eat! I do think you're right. Everyone needs a Close the Door sign. Oh, thanks for sharing. I seriously need a sign like yours. How cute, and the colors - PERFECT. lol! I so could use the Shut The Door Sign for sure!!! Great pictures girl! My favorite is the last one. Beautiful! I remember seeing that Shut the Door sign at Target a few years ago and I never bought it. It is so cute. Thanks for the little outdoor tour. Love your cloche. I'll be at the party too! The stone is such a keepsake. Fish do become like puppies don't they. I ate in a restaurant once with an indoor pool of fish. They would come part way out of the water and beg for food at your table. Enjoyed your pictures. I especially love your wire shelf. How lovely. I've nominated you for an award on my site. happy outdoor wednesday, thanks for sharing your wonderful pictures, what a great idea. Love the creative wallnettes you've made. Hello, fish. How neat they are and what a lovely yard you have. Happy outdoor Wednesday. Loved your post and the wire shelf, I have one similar. Mine is indoors with a collection of McCoy pottey sitting on it. BTW, the rock is priceless. From the wire shelf to the gold fish it all looks so nice. Stacey, that is about the cutest rack ever! I love the way you have it arranged. I love, love, love red geraniums!! I do love your sign! Your photos are terrific. Thank you for sharing them with us. Have a wonderful day. I am in love with the wall shelf...you must tell me where I can get one. I love the way you have it staged...so cute!!! Your outdoor space is sooo wonderful. The little fish are so cute and colorful. Everything looks so pretty and artfully done...love it!!! I hope you are having a wonderful day!!! Your photos are great, I especially love the fish one. Your pond is awesome...love the rocks on the bottom. What is the secret to geraniums...I always end up killing them. Everything looks lovely!! Gorgeous pond! Cloche Party? Where...When? I wanna join! Everything looks great. Love your son's rock.Sometimes I really miss those young days. Mine are 18 and 21 now. I enjoyed my visit so much. Thanks for the stoll. The shelf is great and I like what you've done with it. Love that cute rack and all the stuff you have on it! I have got to get me some geraniums to enjoy this summer. Yours is gorgeous! I need a "Close the Door" sign for my house. I love the rack. Thanks for sharing your photos. Hi, Just came across your site via cozy little house. And I love it - so pretty. Really like the shelf and your outdoors looks beautiful. I am thinking about joining in on some of these memes. Just haven't had the time yet, but looks like fun. Thanks for the tour. Hi Stacey, love your fun post. The coy do love to be fed don't they. Your flowers, especially the geranium is very nice. I agree your caladium is looking quite wind blown. I wish I had a cloche. I keep looking. Hey there Stacey ~ "Shut the Door" is my family's middle name! If I had a dime for everytime those words leave my lips...great sign! I really love how you decorated your rack...and that cloche..be still my heart...well done! Okay, I'm back. I wanted to tell you what my old wooden box says on the side of it. And darned if my email isn't down and I couldn't get to your email address. I have it almost memorized, but not quite. Anyway, here's what it says on the box: "Surplus Relief Commodity, Not To Be Sold." I plan to do thankful Thursday every week again so if you want to join next week I'll have the mr linky for you to sign in. I love your rack. A few years ago I was looking for a rack just like that for my pie bird collection. Never found one! And that little cloche is so cute!! Can't wait to see everyone's cloches at the party! What a nice reminder SHUT THE DOOR. Oh how many times I had to say that to my kids when they were small. I needed a tape recorder. I really love that wall rack, it is a simple and lovely design. I'm planning to join the cloche party too.